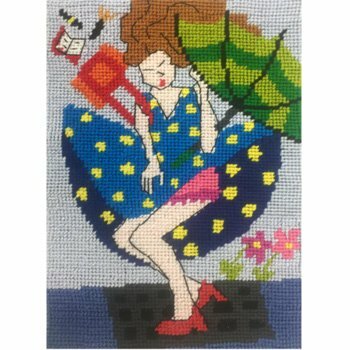 Do you suffer from aches and pains when you needlepoint? We asked a physical therapist to put together some tips and strategies for alleviating pain in the hands, shoulders and neck that can be brought on by prolonged periods of stitching. Our bodies have not adapted well to sitting still for long periods. Repetitive hand and finger movements, like those required in needlework, can also cause aches and pains. Watch out for early signs and symptoms and use these preventative tips. (NB: If you are experiencing symptoms persistently, and they are not relieved with rest, simple stretching, massage, heat packs or over the counter pain relievers; contact your local Health Care Professional). Stop regularly and move. Even before you start to feel discomfort, and certainly as soon as you experience any aching or tension, stop and do something else for a few minutes. Mini breaks should occur every 20-30 minutes and last for 2-5 minutes: Put a load of laundry on; Make a cup of tea; Just get up and do something so that your position is altered and blood is allowed to flow freely to all your muscles and organs. Movement lubricates joints and keeps them healthy and pain free. Mini breaks can not only decrease pain, they increase your concentration, alertness, and productivity - and decrease the mistakes in your work! Here’s a simple stretching program you can do - either standing or in your chair. When? As often as you think of it! 1. Sit up straight with your head up, shoulders back and a small curve in your lumbar (lower) back. 2. Take 3 large deep breaths. 4. Roll your shoulders forwards and backwards 5 times. 5. Interlock your fingers in front of you, raise your arms to shoulder height and push your hands away from you. Hold for 3 seconds. Repeat 3 times. 6. With your hands on your knees, slide your hands down your legs as far as you can go. Hold for 3 seconds. Repeat 3 times. 7. Arrange your hands into the prayer position; push hands together and repeat in reverse prayer position. Repeat 3 times. 8. Clench and open hands quickly 5 times. 3. Avoid crossing your legs. Keep your feet flat on the floor and use a foot stool if necessary. This will maintain circulation to the legs and the curve in your lumbar spine. Good posture is important to avoid aches, pains and long term damage. When sitting, maintain a slight curve in your lumbar spine, have your chest lifted, shoulders relaxed, chin tucked, neck straight and relaxed. Your head and shoulders should be stacked on top of your pelvis and hips. A small lumbar support placed in the small of your back will encourage good posture. An inexpensive option is rolling up a small towel, and securing the roll with tape then placing this in the curve of your lower back. 5. Have your work close. Use a frame stand or, if stitching in hand or using a hand-held frame, consider a lap stand or a lap table to bring your work closer. K's Creations has a lap stand that your framed canvas clamps on to. The beauty of this is that you can remove the canvas from the stand to take it places, and your work is still on stretcher bars. Please note: We are a participant in the Amazon Services LLC Associates Program, an affiliate advertising program designed to provide a means for us to earn fees by linking to Amazon.com and affiliated sites. If a recommended product has an Amazon logo we will earn a small commission upon sale. We only recommend products we genuinely believe function as described and fit the purpose described. These links are provided mainly for customer convenience and we encourage you to shop around and purchase from your preferred outlet. 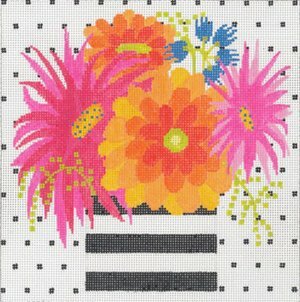 If you like to work with your needlepoint in hand, rather than on a frame, consider using a lap table. Here's an example of a lap table you can purchase, but you can also use a flat pillow. 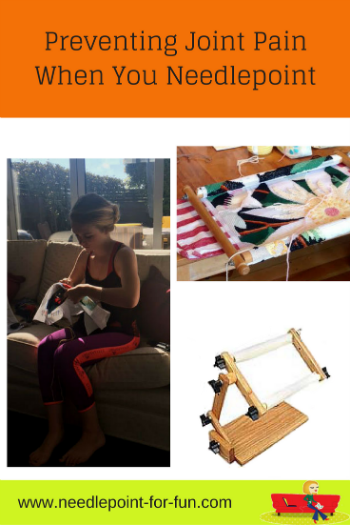 By mounting your needlework onto a frame you will reduce muscle strain. When you grip a hand held canvas your forearm and hand muscles are put on prolonged tension. Using a frame will prevent this. This stitcher is setting herself up for neck, shoulder and arm pain. If her needlework was put on a frame it would be easier to hold. She needs a chair that "fits" her better - one where she can sit against the back rest and still have feet on the floor. Pillows behind the back and a footstool can achieve this. She is also holding her stitching unsupported. so a lap table or pillow in her lap would relieve the tension of holding it close. The more natural light the better. When you don't have natural sunlight use a “daylight” lamp. If you can’t see your work well, your posture will suffer as you squint and lean to catch the light. These are two portable models of daylight lamp. 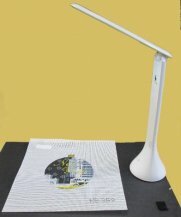 $99.00 This is a highly portable lamp that you can take anywhere and charge it off your computer - great for international travel and hotel rooms. It costs $40. Stitching is relaxing and enjoyable, but only if it is pain-free. Try to exercise each day– even if this means parking in the far corner of the lot. When not sitting at your hobby; MOVE! 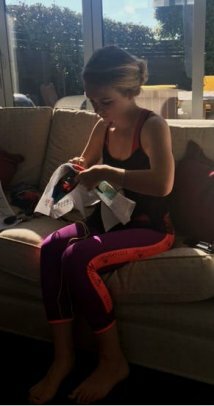 Exercise will increase circulation to all your joints and muscles, allowing you more pain free stitching when it comes time to sit down to your project. 9. Use Gadgets to Make Things Easier. Don't you just love the word "gadget"? Tools such as needle threaders, daylight lamps, magnifying glasses, thimbles, frames and floor stands all help to minimize muscular tension and therefore aches and pains. 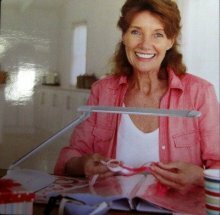 If you plan to do a lot of stitching, research which tools might assist you and relieve some of the strain. 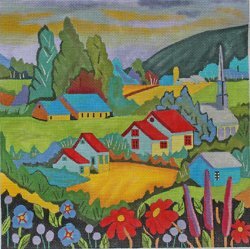 We are currently researching an article on the best needlepoint tools and gadgets so stay tuned to our newsletter for when it appears. We have an article here on tools available for hand and wrist discomfort. Share it on Pinterest or Facebook...or both....or any other social media platform you "enjoy". But, most importantly, don't miss out on reading more information just like it. You'll get exclusive content like you've just read, you'll hear about new designs and kits as soon as we receive them, plus we run a lot of specials on popular items that only our newsletter readers hear about.